The FTTH Conference has grown significantly since 2004 to become the largest FTTH event in the world! 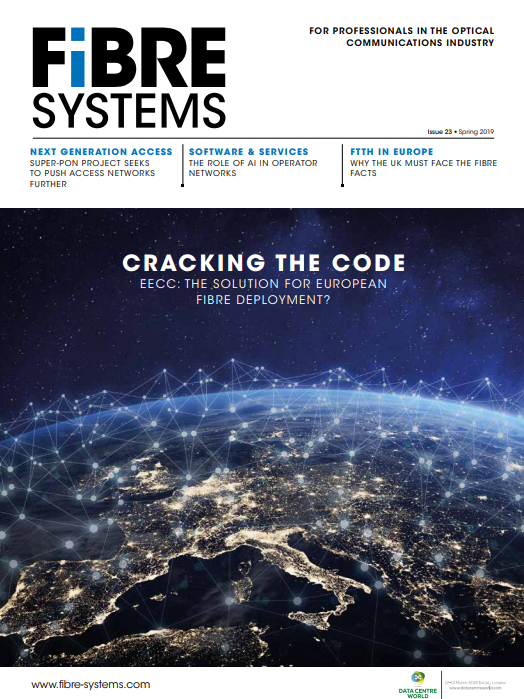 Organised by the FTTH Council Europe, with each annual edition held in a different European city, the three-day event is all-inclusive with conference, workshops, exhibition, hands-on demos and first-class catering. At the FTTH Conference 2016, AVM (booth S23) will present the new FRITZ!Box 5490 for fibre optics. The device is the first product in the range of the German market leader for wireless routers to support direct connection to an optical fibre in FTTH networks. AVM says the new FRITZ!Box 5490 for fibre optics combines everything that makes its flagship DSL device, the FRITZ!Box 7490, so successful: gigabit speed, cutting-edge hardware, free FRITZ!Apps and the diverse functionality of the FRITZ!OS operating system, which now supports smart home functionality. Offering higher speed and greater range in the home network, the FRITZ!Box 5490 features the latest Wireless AC technology with speeds up to 1300Mb/s. Founded in Berlin in 1986, AVM offers a wide range of products for high-speed broadband connectivity and home networking, with support for ADSL, cable, fibre, and LTE as well as wireless LAN, DECT, and Powerline in Germany and Europe. Millions of satisfied customers and hundreds of award-winning products confirm AVM’s commitment to high-quality FRITZ! products and first-class customer service, the company says. BKtel (booth S03), a specialist in customer premises equipment (CPE), invites attendees to discover the unique XON1200 FTTH portfolio, a modular CPE range that enables FTTH operators to save both opex and capex. BKtel’s latest housing allows self-installation by the end user, simply by sliding the XON1200 into the passive fibre termination unit XON30.Different versions of the XON1200 enable the network operator to serve the end customer only with hardware actually required, from a basic unmanaged media converter to a fully managed CPE device. Additionally, BKtel will present its updated optical transmitter and amplifier platform for RF video overlay on FTTH networks. With medium-range or long-distance transmission, the new platform supports the emerging DOCSIS 3.1 standard, preparing operators for the next-generation of technology. BKtel says its high-quality RF video products, made in Germany, have been deployed worldwide, guaranteeing a premium TV performance. CommScope (booth G12) is a provider of products to support fibre-optic connectivity in wireline and wireless networks. At the FTTH Conference 2016, CommScope will present ‘fibre indexing’, a new topology for the fibre distribution network that helps to reduce costs. This architecture leverages standardised building blocks to create a plug-and-play network that is faster and easier to deploy. Additionally, CommScope will display its latest developments in fibre closures, terminals with hardened connectivity and a new range of specialty cables. The FACT optical distribution frame enables faster and easier installation in a high-density environment and features smart fibre management. Quareo physical layer management enables instant visibility of unauthorised physical intrusion, activity awareness control, and automatic documentation changes. Comsof (booth B03) says its FiberPlanIT software helps operators turn FTTH plans into profit. Not only will it aid network designers during the strategic and the detailed planning stages of FTTH projects, it also helps operators to cut costs during deployment and operation phases. The software optimises the area classification during the strategic planning phase, which reduces the time to market and improves time to revenue. And it increases the quality of FTTH designs by improving the accuracy and ensuring uniform designs across different teams. At the conference the company will show the latest version of its software, which is constantly being improved by incorporating the experience of ongoing projects. Currently FiberPlanIT has been used in more than 120 projects by telecom operators, municipalities, contractors and consultancy firms in more than 35 countries. Condux (booth B43) blown fibre machines allow safe, quick easy installation of all fibre types from larger backhaul fibre cables to small cables in the final drop, and a full range of equipment suitable for every install. In Luxembourg, Condux will demonstrate the new GS 150 blowing unit, which has been optimised for small cable and fibre units 1 – 2.5mm in diameter, and tailored for last drop and access network applications. The unit interfaces to a wide range of compressors using quick release couplings, and has the option to specify different cable and duct sealing packs according to the user’s requirements. Alongside the GS 150 Condux will be showing the GS 300 cable installation unit designed for cables with diameters in the range 3 to 10mm, which typically use microducts between 10mm and 18mm diameter. The GS300 features software adjustable push force (torque) settings and variable speed control with a user-selectable display. Emtelle (booth G09) is offering its FibreFlow product portfolio, which includes blown, pulled and pre-connectorised fibre technologies, designed to reduce installation, termination and on-going costs. Microducts and tube bundles can be pre-laid in preparation for future fibre installation – including Emtelle’s Vertex microtrenching, MultiFu, RTRYVA, and Double Connect ranges – all of which have been specifically developed with ease of installation in mind. Emtelle’s products have been employed in various challenging and exciting FTTH projects worldwide, including multiple dwelling units, new and existing builds, and rural projects – including the high-fibre-count cables used for backhauling FTTH connections to local exchanges. Emtelle says the FibreFlow range can be used in almost any installation scenario, whether above or below ground. Filoform UK (booth B06) manufactures and supplies components to connect, seal and protect underground cable networks. This year Filoform will introduce several new products designed for use in FTTH networks, which will be on display at the exhibition. Designed to seal building entry points, Filoform’s FTTH MDI duct sealing system is suitable for microducts and cables up to 10mm in diameter. The sealing cap is applied to the wall using the special anchoring pin, eliminating the need to drill additional holes. Injection of Filoform’s expanding polyurethane resin creates a strong and durable seal that is both gas and watertight. Filoform also produces an FTTH 90-degree entry cover with a 40-mm bend radius to allow safe and secure bending of microducts/cables and blowing of the fibre after installation. The entry cover can be used with microduct/cable sizes up to 8mm in diameter, and includes space to accommodate a gas block connector. Join GE (booth B09) to learn how its Smallworld Network Inventory product can help to reduce capex and opex across the entire ‘plan, design, build, operate and maintain’ network lifecycle. GE’s geospatial software provides an advanced planning and design capability that not only automates the design process but results in a highly optimised, low-cost design. Understand how integrated inside and outside plant inventory can enable further savings during network operations and maintenance, particularly by enabling field staff to gain direct access to the inventory data and to seamlessly update the data with as-built network changes. See the value of geospatial analytics that can be used to combine inventory data with a wide range of other data sources and realise new insights on your network to support improved capacity management, planning and operations. HellermannTyton (booth B23) is an established provider of network infrastructure cabling, offering broad range of quality, high-performance connectivity products for both residential and commercial use. They will be exhibiting their wide range of fibre-optic splice closures and FTTx products. Also on show will be a brand new range of FTTH products designed to provide connectivity in MDU (multiple dwelling units), MBU (multiple business units) and SDU (single dwelling units) applications. These new products include building entry points, floor distributors and customer connection points. With a new catalogue and many new products already available, the HellermannTyton team will be happy to discuss the products on display and any requirements you may have. Huber+Suhner (booth G04) will once again create a splash with its campaign to connect the next generation – bringing ‘fibre to our kids’. The demand for bandwidth in homes continues to grow exponentially, and network operators increasingly face challenges in meeting the explosion of in-home demand. A decade ago, an average European household had one desktop computer and one TV. However, the unprecedented success of smartphones, internet TV and cloud services has forced the need for fibre in homes to a new level. The industry is shifting from a ‘technology push’ towards an ‘end-user pull’. The data consumption of future generations will require millions more FTTH installations in the future. Huber+Suhner extensive portfolio of products is helping operators to meet the demands of the future throughout the whole network from the central office to outside plant through to products designed for fibre in the home. John Guest (booth B21) has a long-established reputation as a leading manufacturer of push-fit fittings, tube and other fluid control products. This reputation is built on producing consistently high quality products with an ongoing commitment to value engineering and product development. John Guest’s blown fibre fittings have been specially designed for the telecoms market, for use in local loop, network and customer box applications. The extensive range of push-fit connectors cover both blown fibre and cable pressurisation systems and includes gas and water block fittings. The simple-to-use connectors help ensure that installation can be completed quickly and reliably. Keymile (booth S17) will be presenting products and services to enable efficient and reliable broadband networks. When planning sustainable networks, operators must take into consideration interoperable technologies and their ability to enable ‘open access’. Future networks must be open to multiple service providers in order to fulfil the future demands of new services but also customer demand. One way to reach that goal is though virtualisation of network functionality. With this in mind, Keymile will be presenting its concept of software-defined access network, which will give customers much lower capex and opex in combination with much faster service implementation, and the option for new revenue streams and margin elements. On their stand they will showcase street cabinet equipment that can migrate to the software-defined access solution. The underground chamber from Micos (booth B18) provides a comprehensive fibre connecting scheme for microduct systems intended for underground installation. The lower part of the chamber is used to terminate incoming microducts with water blocks. The cables continue through the dividing lower part of the chamber into the upper part, where reserve cables can be stored in prepared fittings. Instead of a standard dome closure, the fibres are connected in a simpler box mounted on a stand. After finishing the assembly, the box with cable reserves is placed in the chamber, installed in a pre-selected location and covered by a ‘bell’ that creates an air pocket. The air pocket ensures that ground water cannot reach the box, preventing it from flooding. Therefore, the box itself does not need IP68 ingress protection. The ‘bell’ also provides protection against mechanical damage. The system also includes a locking collar that fixes the ‘bell’ and increases protection against unauthorised entry. In booth G16, Swiss structured cabling specialist, Reichle & De-Massari (R&M) will showcase R&Mfoxs, its modular fibre-optic cross-connection system. R&M's latest addition to the product range is the unique SYNO dome-end splice closure with its innovative, reusable gel cold seal. The features of this innovative product include flexibility, convenience, efficiency, performance and sustainability, the company claims. The configuration can be adapted at any time to suit both current and future FTTx scenarios, enabling network operators to plan more quickly and with more customisation. The cable entry guides and seals are intuitive to use, making installation quicker and more reliable. Fibres can be inserted, passed through and spliced in record time. Safety features aid error-free fibre management. The gentle 40-mm bend radius ensures optimum signal quality, even for future high-power applications. The climate- and moisture-resistant splice closures will provide decades of use, backed up by long-term support and guarantees from R&M. Senko Advanced Components (booth B19) will introduce the XP Fit Plus LC-APC field installable connector. XP Fit Plus LC APC is a pre-polished, preassembled connector that is compatible with standard LC connectors. No epoxy is required as an internal mechanical grip effectively holds the fibre in place, using index matching gel to achieve a high-quality connection. Without the need for epoxy curing and hand polishing at the work site, the XP Fit Plus makes on site installations quick and easy, enabling connections to be made in less than two minutes. The mechanical splice connector comes in a compact package that is highly stable and reliable. The materials meets UL94-V0 requirements for flammability and are RoHS compliant. Last but not least, the finished connector is compliant with the TIA/EIA 568-C.3 telecom cabling standard. Skylane Optics (booth S01) is a provider of transceivers for optical communication. The company offers an extensive portfolio for the enterprise, access, and metropolitan fibre-optic market as well as for smart home applications and home networks. With offices in Belgium, Luxembourg, Brazil, Sweden and Taiwan, products are available across the European market through a strong partner network. Skylane’s offerings are characterised by high quality and performance. In combination with strong technical support, the company aims to enable customers to build cost-optimised networks.